February being the anniversary month marks a special space in TNC's history. 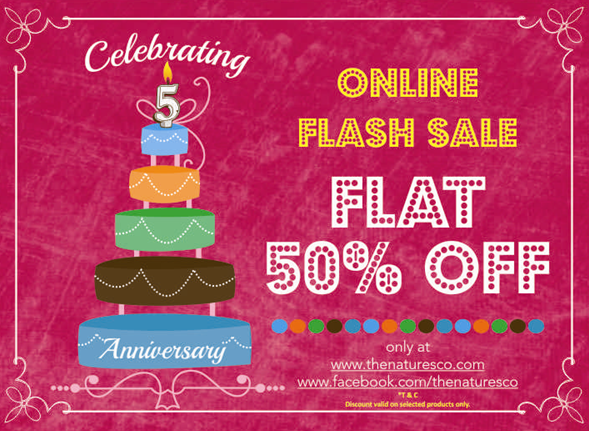 This 5th anniversary celebrations starts with the first ever Mega Online Flash Sale with an unbelievable and massive discount for all the beauty addicts. Bid farewell to these chilling winters, and look forward to the bright spring with stocking your beauty closet with The Nature's Co products at a FLAT 50% off on an exclusive selection of 50 luxurious products. If you have missed getting anything from your beauty wish list for the coming season, you really have no reason to wait! Get fully loaded, enjoy the grab fest at TNC's Online Store & Facebook Store, and make use of this ideal chance to stack up on your favorites!